It’s a repressive theocracy, but Tehran is no threat to the United States and is a staunch opponent of jihadi groups like ISIS and Al Qaeda. “Where are you from?” the elderly man asked politely, as my wife and I strolled through his small Iranian village in early May. I am not shy about criticizing US government policies—when I’m home in America. But, when I’m abroad, I tend to get defensive about my country. So, I muttered something about the importance of people of different nations getting to know each other independent of their politicians, and turned our conversation to the history of his ancient town. Demonization of Iran runs wide and deep in our mainstream politics. But his question—asked of us by many other ordinary Iranians happy to meet American visitors—deserves a better response. Not so much to explain our foreign policy to Iranians, but to ourselves. Following their leaders, most Americans have strongly negative opinions of Iran. Polls report that they see the country as only slightly less dangerous than nuclear-armed North Korea. Despite the public’s support for non-proliferation, a majority opposed Barack Obama’s nuclear agreement with Iran. To protect that agreement, Obama is piling on to the already massive US military assistance to Saudi Arabia and Israel, with the curious rationale that Iran, now that it has forsworn nuclear weapons, is somehow more of a menace to them than it was before. The distrust is mutual, but Iranians’ mistrust of America is rooted in long historical experience. The animosity, of course, is mutual. Since 1979, Iran has been ruled by Islamic theocrats who use the Quran to justify the suppression of domestic political freedom and the denial of civil and human rights. With materialist goals subordinate to religious values, and hobbled by US-led global sanctions, the economy consistently sputters. The sanctions allow the ruling mullahs to divert discontent by blaming outsiders for the nation’s troubles—in particular, the “Great Satan,” America, and its ally Israel. To American ears this language sounds shrill and paranoid. It recalls images of the angry mobs that in 1979 stormed into the US embassy in Tehran and held 52 Americans hostage for 444 days. But to Iranians it is rooted in historical experience. After all, the United States engineered the 1953 coup against their democratically elected secular government and imposed a ruthless monarchy on the country for 25 years. The organization of the Shah’s murderous and torture-addicted secret police was a joint venture of the US Central Intelligence Agency and Israel’s Mossad. When the Iranians finally revolted and deposed the Shah, the US backed the 1980 attack on Iran by Iraq under Saddam Hussein. The eight-year war cost Iran an estimated million casualties, including at least 300,000 soldiers killed and tens of thousands still suffering the effects of the chemical weapons used by the Iraqi army, with the collaboration of the United States. Today, enter almost any urban neighborhood or rural village in Iran and you will see prominently displayed photos of the local men—and a few women—who were killed in that war. During that war, a US missile cruiser entered Iranian waters and shot down an Iranian civilian airliner, killing some 290 passengers. We never apologized, and the trigger-happy US naval commander was later decorated for “exceptionally meritorious conduct.” US warships continue to violate Iranian sovereignty in the Persian Gulf. The accumulated distrust of American intentions extends to the US-engineered economic boycott over Iran’s nuclear program. Our expressions of angst over nuclear proliferation seem less than honest, given that America tolerated the development of nuclear weapons in both Israel and Pakistan—both of whom have refused, unlike Iran, to sign the non-proliferation treaty. Today, many Iranians doubt the United States will actually deliver on the commitments it has made to loosen financial restrictions on investment and trade. Still, despite the inflammatory rhetoric of its leaders, Iran is by no stretch of the imagination a serious threat to the United States, Europe, its Arab neighbors, or Israel. At best, it is a third-rate military power with a dysfunctional economy who’s entire GDP is only a little over 60 percent of the US military budget. The supposedly terrified Israel has somewhere between 80 and 200 missiles with nuclear warheads that could send Iran back to the Stone Age in minutes. There is no evidence to suggest that even the most fanatical elements in the Iranian government are suicidal. 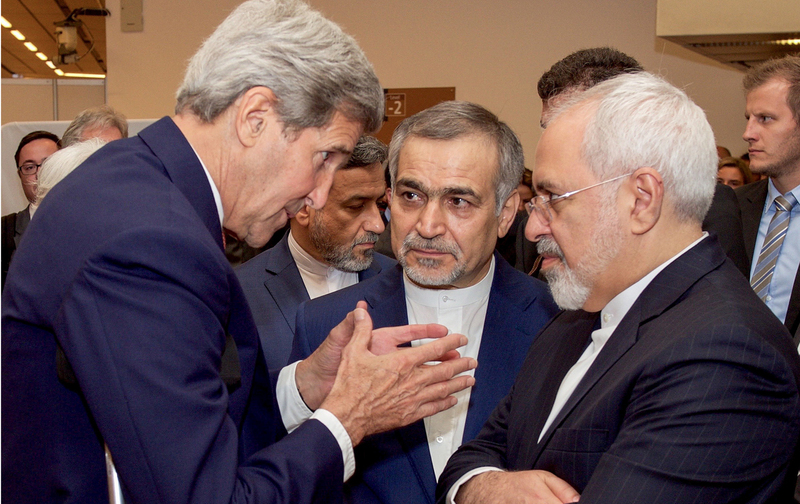 Iran tries to influence events in its neighborhood, but its “soft power” appeal is limited. Pakistan, on Iran’s border, is similarly armed. The two other major powers in the region, Turkey and Egypt, are militarily superior to Iran. Even Saudi Arabia, with one-third of Iran’s population, has a bigger and better air force. Beyond its military weakness, Iran’s “soft power” appeal in the region is also limited. Neither its people nor their language is Arabic. And in a part of the world where religious sectarianism is taken very seriously, Iran’s brand of Islam is Shia, which represents less than 15 percent of the Muslims in the Middle East and North Africa. Like all sovereign states, Iran tries to influence events in its neighborhood. Given the lingering trauma of the war with Iraq, the Saudi/Sunni rivalry and the hostility of the US superpower, Tehran’s primary objective is stability on its western border. This means friendly governments in Iraq, which has a Shia majority, and in Syria, where despite a Sunni majority, the ruling class is Alawite, an offshoot of Shiism. Like all Islamic states, Iran supports the Palestinian cause against Israel. Here again, a sub-context is rivalry with Saudi Arabia. Iran was a major supporter of Hamas until recently, when the wealthier Saudis elbowed them out. It also remains the primary outside backer of Lebanon’s Hezbollah, although in recent years Iran’s economic troubles led to cutbacks in its financial support. In any event, there has been no significant fighting between Hezbollah and Israel in ten years, save for a few skirmishes when one or another’s soldiers get too close to the border. Coming from the US foreign-policy hawks whose Middle East interventions lit the fuse of civil war, religious fanaticism, and barbarism, the charge that Iran is the source of regional instability is absurd. Moreover, while our supposed allies, the Saudis, were busy covering up their links to the perpetrators of the 9/11 attacks, the Iranians granted the United States permission to fly to Afghanistan over their territory, agreed to help rescue downed American pilots, and provided assistance to the Northern Alliance—America’s military ally in the US invasion. All of which American officials have acknowledged. Social life is nowhere near as repressive in Iran as in US-supported theocracies like Saudi Arabia and Bahrain. This fear of the West is enormously useful to the Islamic reactionaries in their ongoing struggle to keep control of Iran’s future. The conservative Supreme Leader, Ayatollah Ali Khamenei, rules for life and commands the loyalty of the armed forces. But there is a sizable and growing popular movement in Iran for more liberal foreign—as well as domestic—policies, including more contact with the United States. Despite the obstacles to democracy, in 2013 the people elected a progressive reformer, Hassan Rouhani, as president, who, after a two-year struggle, led Khamenei to accept the nuclear agreement. Evidence of growing Westernization is widespread in Iran—in the shops and shopping malls, the billboards advertising appliances and cars, the cellphones and selfies, and especially in the visible pushback by women against the strict Islamic dress code. Social life is nowhere near as repressive as in the US-supported theocracies of Saudi Arabia, Bahrain, United Arab Emirates, Oman, or Turkmenistan. Women in Iran drive cars, manage businesses, and are elected to public office. Between 20,000 and 30,000 Jews live in Iran—the largest Jewish population in the Middle East outside of Israel. There are some 60 synagogues, a Jewish Member of Parliament, and a memorial in Tehran to Jewish soldiers who served in the war with Iraq. Jews, like Christians and Zoroastrians, are allowed to practice their religion, but not to proselytize. It’s no liberal democracy, but hardly Nazi Germany—or Saudi Arabia. So, as the Iranian villager asked, why does our government hate them so much? Have US interests in the Middle East been subordinated to those of Saudi Arabia and Israel? The only answer that makes sense is that it reflects the subordination of US policy in the Middle East to the interests of 1) the despotic dynasties that rule Saudi Arabia and the gulf sheikdoms; 2) the Israeli government, especially under Prime Minister Benjamin Netanyahu; and 3) the American politicians, pundits, lobbyists, and national-security bureaucrats whose careers and bank accounts are enhanced by both. It is in the interests of all three to divert attention from the catastrophic consequences of our intervention in the region. How else can you explain the Bush and Obama administrations’ reluctance to confront the ruling classes of the gulf sheikdoms for their nurturing of ISIS and other terrorists groups inspired by the Saudis’ own Wahhabi fundamentalism? Only when ISIS threatened the Saudis themselves did their support for the Islamic State cease, although it continues to flow to the principal Al Qaeda affiliate in Syria. And how else can we explain the US supply of weapons (including cluster bombs) and aerial intelligence to the Gulf States’ intervention against the Houthi Shias in Yemen, while letting them go AWOL in the war against the Sunni ISIS? For Netanyahu, Iran provides the monster needed to rationalize and divert attention from his own disastrous and brutal policies in the West Bank and Gaza. During the 1980s, the monster was Iraq under Saddam Hussein. After Saddam’s regime was destroyed and Iraq was occupied by the United States, an alleged genocidal and irrational Iran became the principal horror narrative of the Israeli right wing, a line promptly echoed by the US policy class. To Barack Obama’s credit, he was willing to push through the snake pit of divided Washington loyalties to achieve the nuclear deal—far more important to our national security than isolating Iran. To complete the deal he must also make sure that the United States lives up to its promise that it will not punish international bankers who provide capital for urgently needed economic development projects in Iran. A growing economy should in turn reinforce the still fragile shoots of liberal democracy sprouting in that ancient land. It will of course take time to erode the mutual mistrust between the governing classes of the two countries. But for ordinary Americans, understanding that Iran is not our existential enemy should help us to answer the larger question of exactly what we are doing in the Middle East.